Between October 19-25, Alpinist contributor Marc-Andre Leclerc posted his photos and stories on our Instagram, Facebook and Twitter pages as part of our Alpinist Community project. His notable ascents are included in several NewsWires, including: Solo Triple Linkup on Slesse in Alpine Ninja-Cat Style, Speed Soloing the Chief, Marc-Andre Leclerc Solos Cerro Torre's Corkscrew Route and Soloists Visit Patagonia in Winter. Additionally, he is the winner of the 2015 Guy Lacelle Pure Spirit Award. In Matt Van Biene's Chalten Portraits, Van Biene says of his climbs in Patagonia: "Basically, Marc has turned one of the most challenging mountains in the world into his home crag." Leclerc turned 22 on October 10, 2015. Below is a compilation of his work from that week. Leclerc calls this collection of seven photos Moments of Deja vu. "I'll be placing a piece or at a belay, and suddenly feel like I've been there before in a dream. It always happens on important or really special climbing days." When Brette Harrington and I approached the southeast face of the Grand Cappuccino tower (5.12a, 8 pitches; incomplete) in the Waddington Range of B.C, we didn't even know whether or not�the feature had been climbed. We chose our route by simply�following our noses, and the line that we weaved up the face was so fine it felt as if it were climbing itself for us. Read Brette Harrington's story "What the Heart, Only, Sees" of her freesolo ascent of Chiaro di Luna (5.11a, 750m, Giordani-Manfrini-Valentini, 1987) on Aguja Saint-Exupery (2550m) in Alpinist 51. 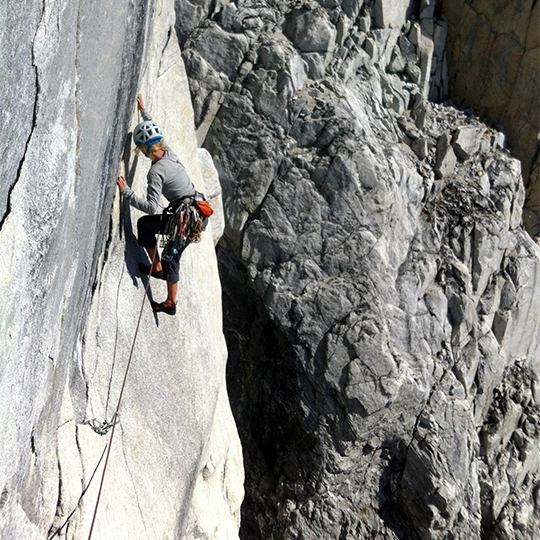 Joshua Lavigne leads the heady crux pitch of "The Wild Thing" (5.9+ M7, 1400m, Arbic-Blanchard-Robinson, 1987) on Mt. Chephren (3266m) just before darkness sets in. After scratching our way up steep mixed chimneys by the lights of our headlamps, and�topping out, dehydrated around 2 a.m., the cold shiver around the stove felt�like�my initiation to a new level of commitment in climbing. Read the NewsWire from December 17, 2014 here. Arriving at the base of Cerro de la Mariposa is one of the single greatest moments I can recall. I felt I had been in the talus once before in a dream. A few days later we topped out the wall and the view of granite valleys made me feel like a microscopic being. Climbing the North Face of Cerro Torre was like taking a step inside all of the mountain lore I had grown up loving as a child. As we climbed, the dynamic conditions of the Torre hurtled snowballs at us with little respite. 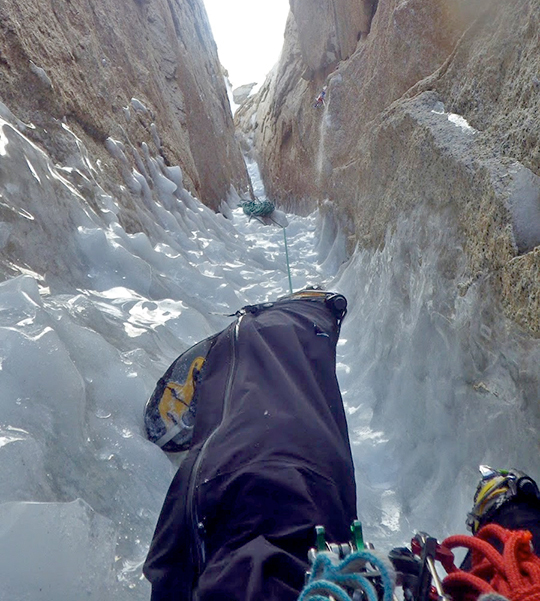 Here, Colin Haley leads the second pitch of an incredible 100-meter hand crack high on the face. 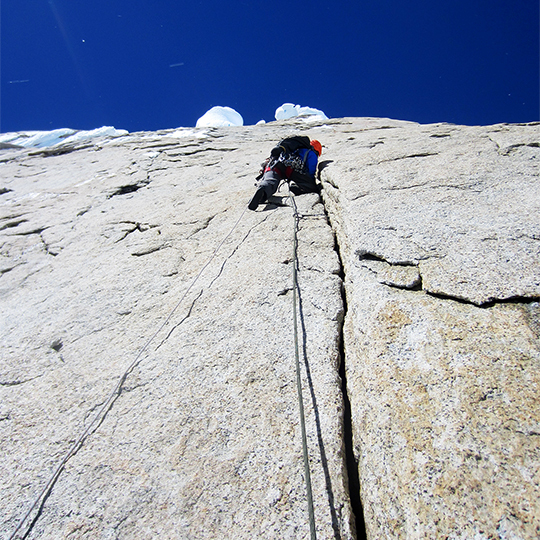 Read the NewsWire "North Face of Cerro Torre Gets First Integral Ascent" from February 18, 2015. Looking down into the mist-flooded Torre Valley from the Southeast Ridge of Cerro Torre (3100m) at sunrise. I watched the sun rise over the dense bank of cloud and waited as it melted the verglas, leaving me with clean dry stone. 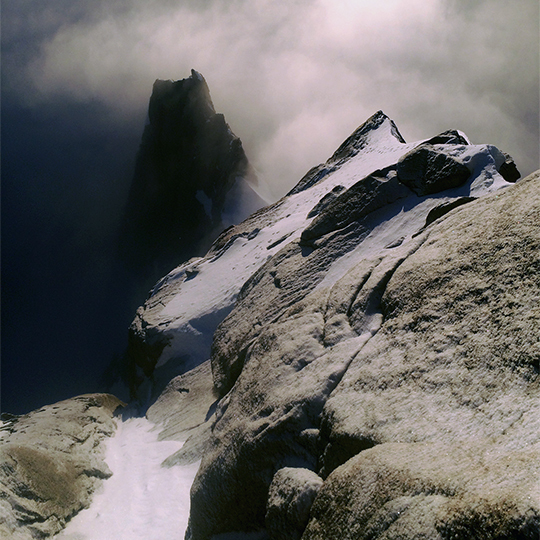 Read the NewsWire "Marc-Andre Leclerc Solos Cerro Torre's Corkscrew Route" from March 4, 2015. 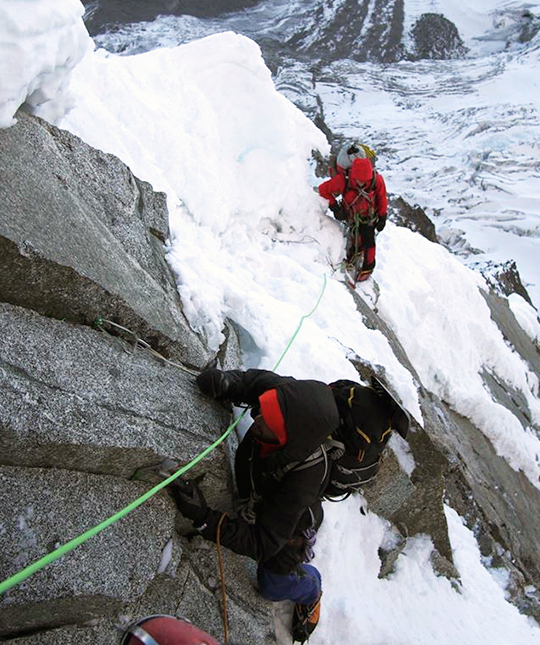 The quality of the climbing on Aguja Standhardt (2700m) remained excellent from base to summit. A fun mixed slab peppered with edges, and a narrow squeeze tunnel in the final mushroom provided an entertaining exit. What a joy to climb such classic mountain routes in a place as grand as an empty Torre Valley in winter. Leclerc completed an onsight, free-solo ascent of Aguja Standhardt via Tomahawk (Grade 5 C1 WI6, 450m) to Exocet (Grade 5 WI5+, 500m) to reach the summit. Leclerc freed the C1 section of Tomahawk. 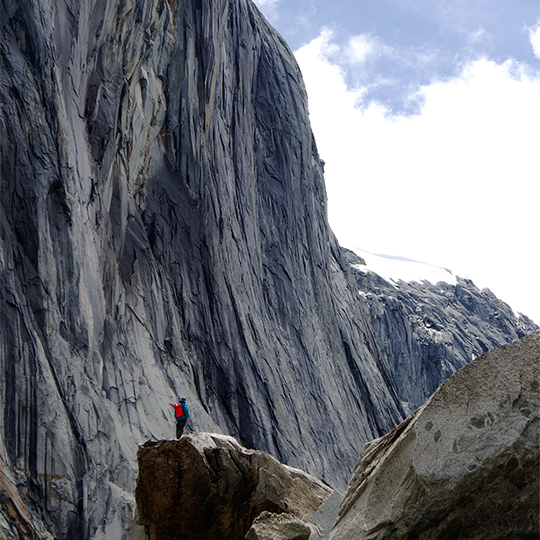 Read the NewsWire "Soloists Visit Patagonia in Winter" from October 7, 2015. 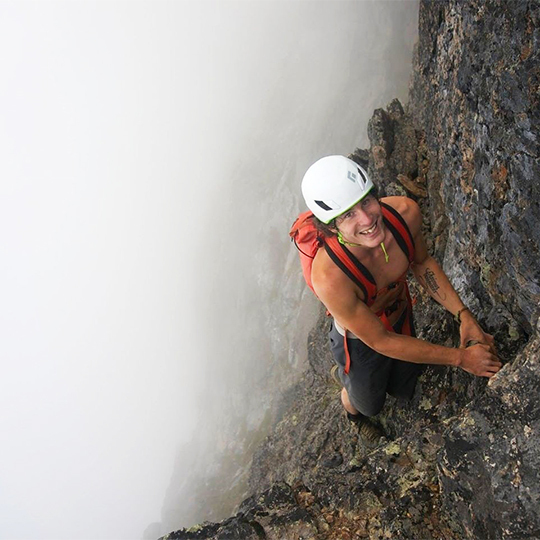 Leclerc high on the East Pillar (5.10c), one of three routes he climbed, freesolo on August 30, 2014—covering 7,000 feet of terrain—on Slesse Mountain (8,002') in British Columbia's Cascade Mountains. Leclerc passed Ashley Green and Bram Whillock during his last lap on the formation. Green snapped this image with Whillock's camera. Read the NewsWire "Solo Triple Linkup on Slesse in Alpine Ninja-Cat Style" from September 4, 2014. To learn more about Marc-Andre Leclerc, check out his blog, Facebook page or follow him on Instagram.